A song to play while you’re reading about the Cardinals: “The Glory of Man” by Minutemen. This song is track 20 on the 1989 CD release of Double Nickels on the Dime, and in 2019 the Cardinals will attempt to finish ahead of the Pirates in the NL Central standings for the 20th season in a row. That’s currently the longest in-division streak in MLB and probably throughout the big four sports but who has the time for that sort of research. Anyway, it’s a good song. Meet Paul Goldschmidt. He goes by Goldy (or worse, according to Baseball Reference, “America’s First Baseman”) and he’s one of the very best baseball players in the world. He plays for the Cardinals now and for the foreseeable future, and though as Joe Sheehan noted the Cardinals need Goldschmidt’s talents less than most teams — he’s displacing a very good Matt Carpenter at first, who is taking his likely worse defense to third base where he’ll displace a very fine Jedd Gyorko at third. We all know you don’t pass on Jordan because you already have Drexler, so if the opportunity to take on arguably the best player in the National League presents itself, you take it and figure it out from there. 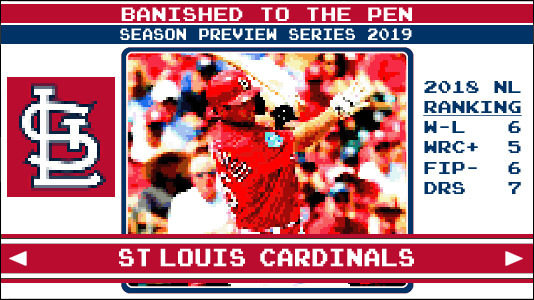 That’s what the Cardinals are doing and they’re hoping Goldschmidt’s presence will give them that bit of extra oomph to push them into the postseason for the first time since 2015. It won’t be easy. The NL Central is going to be a grind with three teams arguably positioned to win 90-plus games. And if we learned anything from the 2018 Cubs (a lesson we all already knew but it bears repeating), it’s that winning the division is important. There’s some security there. Settle for the Wild Card and your fate rests in the hands of the baseball gods and mighty Terrance Gore at the bat. So please pardon Cardinals fans if they’re frustrated with the front office’s dependency on this Pritchard Scale-like algorithm that consistently puts the team right in that competitive part of the curve, but never securely looking down on the rest of the division, as was so commonplace from 2000 through 2015. Perhaps excuse our spoiled souls, too. Whatever happens this season will be intimately tied to pitching. Not exactly a bold take for any baseball team but that seems especially true with this club. A fine spring has rookie Dakota Hudson in the fifth spot in the rotation as a fill-in for Carlos Martínez and his achy shoulder. Michael Wacha has always been steady when on the mound (the first two times through the order, at least) but he has only eclipsed 150 innings twice in his career. Miles Mikolas and Jack Flaherty are counted on to not regress too much from their breakout 2018 seasons. And Adam Wainwright is here for his final act. That’s the crew in front of a bullpen that was nothing short of a disaster in 2018, but the presence of lefty Andrew Miller and perpetual top-prospect Alex Reyes should ideally re-write that script. All in all, this is a good team with room for greatness or colossal disappointment if you look hard enough. So it goes in this river town these days. What is the Cardinals’ most recent accomplishment? As noted, the fans aren’t content with an 88-89-win model in hopes of making the Wild Card, but that apparently hasn’t prevented the organization from convincing their rival division-mates that 90 wins really is the new black. How will the Cardinals define success in 2019? Postseason. They have to play extra baseball. Winning the division will beget enormous goodwill while making the Wild Card game will at least keep most angry fans at bay for the time being. He has a batting stance that mirrors one of those large inflatable balloon men outside a gas station blowing in the wind, but he somehow makes it work as evidenced by a 130 wRC+ in just under 1,000 career plate appearances. Oh, and his career didn’t begin until he was 28 years old. He’s a lovable guy, by all accounts a great teammate, and just a wonderful story all around. He also goes by the nickname Cafecito or Café and just unveiled his new coffee brand which you can purchase here. The MV3 Triple Bobblehead being given away on Sunday, July 28 to celebrate Albert Pujols, Jim Edmonds, and Scott Rolen, who all finished in the top-5 for NL MVP in 2004 and combined for over 25 WAR. They were the backbone of a team that won the most games in the NL since the 1986 Mets (still true! ), and who were probably the greatest Cardinals team of my lifetime. As others have noted before me, it remains an enormous bummer that they cancelled the World Series that year.